The assigned mesh objects will be moved to the new Avastar. Th Belleza Developer Dummy can not be converted fully automatic because it has its arms in A-Pose. For Avastar 1.6 we have added a very easy way to convert this mesh to Avastar. Below the Scale panel you find the Dimensions panel. Check that the mesh is about 1.753 blender units high. If this is not the case, then you made something wrong. Check the previous steps. Something has gone wrong there. Make sure that you have prepared your Mesh as described above. Only then proceed! Now the Appearance sliders should work and the Belleza Mesh is rigged to Avastar. All possibly edited Bones (Joints) will be transferred. The assigned mesh objects will be copied to the Avastar. When your Armature has been edited, then you need to copy the modified bones to the Target Armature. Functionally all that is needed is to transfer the relative position of the bone joints. 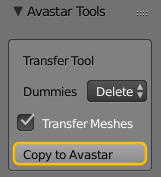 This option only shows up when the Source Armature is not an Avastar Armature. The option is not necessary for Avastar to Avastar copies because for that case the joints are always adjusted automatically. 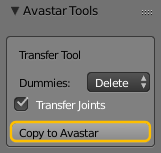 This option only shows up when the Source Armature is an Avastar Armature. The option is not necessary for Migration copies (from non Avastar Rigs to Avastar) because we assume for that case that all visible Meshes have to be migrated as well.